We love our new GSD puppy Max! My husband and I had a Golden Retriever named Lucy that died of cancer 6 months ago. She was the sweetest most loyal dog I had ever had. We have two little girls that just adored her as well. We knew we wanted another dog but couldn't fathom getting another golden because there was no replacement for sweet Lucy. We finally decided to get a GSD puppy because my Mom had a rescue GSD years ago and he was so sweet, and goofy. We finally got Max who is 13 weeks old. He is so smart! He is already the most well behaved puppy I've ever seen. He was housebroken in 6 days, he can do over a dozen tricks, and most importantly is my little girls new best friend. Everyday the girls come home from school and they all go out and play for hours together in the backyard. I never thought I could love a dog as much as our sweet Lucy, but Max is just as sweet and loyal. Hey there, Chesie. It is so good to hear from you way over in Alabama. Thanks so much for taking the time to come here and sharing your German Shepherd puppy Max's story with us all today. Love the picture - he looks soooooo comfortable just hanging out with that toy! 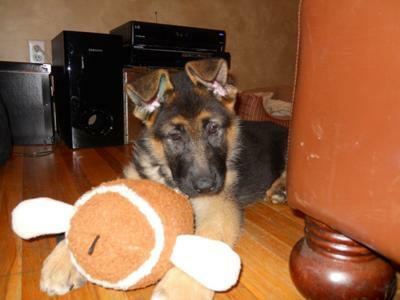 And he looks kind of sleepy too - such a handsome German Shepherd puppy - and that toy looks almost as big as he is. And Total German Shepherd Dog readers - thanks so much for reading along with us here. Let us know what you think about the story of GSD puppy Max by leaving some interesting comments below. It's easy enough to do - just click on the link that says "Click here to post comments".